AIM Password Recovery is the best AIM (AOL Instant Messenger) password finder that instantly cracks and recovers AIM passwords stored on your local computer. It works when the "Save Password" or "Automatically Sign In" tickbox is checked in the messenger. One click and find all your screen names and passwords immediately, and 100% correct, even if you cannot boot into Windows. Instantly recover AIM password stored on your local computer. Work with AIM 6, AIM 7 and AIM Pro. All versions of AIM (AOL Instant Messenger) 6.x, AIM 7.x and AIM Pro are supported. Recover forgotten, lost or saved passwords to all AIM accounts. Crack and decrypt the AOL Instant Messenger passwords saved on your computer. New! Restore AIM passwords even if you can't boot to Windows. Recover AIM passwords from external hard disk drive. 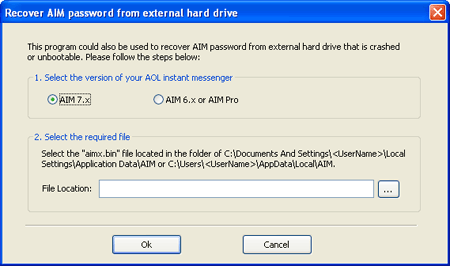 Screenshot 1: AIM Password Recovery allows you to instantly find, crack and recover AOL Instant Messenger account passwords from AIM Pro, AIM 6.x and 7.x. Screenshot 2: Recover AIM password from external hard disk drive. You haven't logged into your AIM account in about a year, and you don't remember the password. Can't get into your AIM Mail or AOL Mail email account. You sign-into AOL Instant Messenger every day. The messenger logs in automatically because the password is saved on your computer. You want to login into AOL Instant Messenger on another machine but you don't remember your password anymore. Need to do a format but you forgot your AIM password. The saved password will be lost after reinstalling system. You changed/reseted the password for your AIM account and then totally forgotten it. "Since that I forgot my AIM password, I could neither check my AIM email or log in AIM instant messenger for some time, just this program make difference today! Many thanks to the author of this software!!!" "Your program is a life saver. It help me find my AIM password within seconds. Thanks a lot." "Thank you! I have managed to sign into my aol instant messenger account using your excellent software. I will recommend your software to my friends." 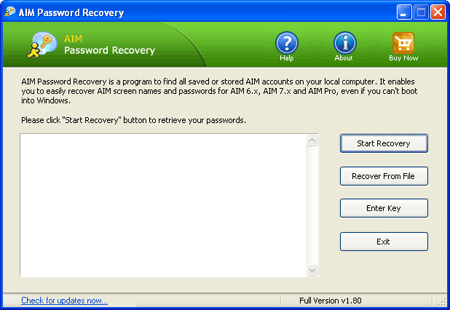 Learn How can you recover AIM passwords easily with AIM Password Recovery program.